At this point, it would be useful to discuss wire rope nomenclature in somewhat greater detail because the subject may generate some misunderstanding. The reason for this stems from the practice of referring to rope either by class or by its specific construction. Ropes are classified by the number of strands as well as by the number of wires in each strand, e.g., 6 x 7, 6 x 19, 6 x 37, 8 x 19, 19 x 7, etc. However, these are nominal classifications that may or may not reflect the actual construction. For example, the 6 x 19 class includes constructions such as 6 x 21 filler wire, 6 x 25 filler wire, and 6 x 26 Warrington Seale. Despite the fact that none of the three constructions named have 19 wires, they are designated as being in the 6 x 19 classification. Hence, a supplier receiving an order for 6 x 19 rope may assume this to be a class reference, and could possibly furnish any construction within this category. But, should the job require the special characteristics of a 6 x 25 filler wire, and a 6 x 19 Seale is supplied in its stead, a shorter service life may result. To avoid such misunderstandings, the safest procedure is to order a specific construction. In the event that the specific construction is not known or is in doubt, the rope should be ordered by class along with a description of its end use. Identification of wire rope in class groups facilitates selection on the basis of strength and weigh/foot since it is customary domestic industry practice that all ropes (from a given manufacturer) within a class have the same nominal strength and weigh/foot. As for other-functional-characteristics, these can be obtained by referencing the specific construction within the class. 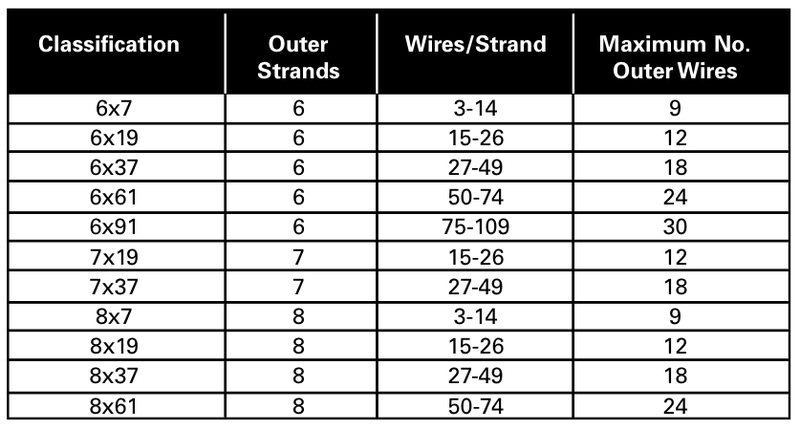 Only three wire ropes under the 6 x 19 classification actually have 19 wires: 6 x 19 two-operation (2-op), 6 x 19 Seale (S), and 6 x 19 Warrington (W). All the rest have different wire counts. In the 6 x 37 class there is a greater variety of wire constructions. The commonly available constructions in the 6 x 37 class include: 6 x 31 Warrington Seale (WS), 6 x 36 WS, 6 x 41 Seale Filler Wire (SFW), 6 x 41 WS, 6 x 43 Filler Wire Seale (FWS), 6 x 46 WS, etc. – none of which contain exactly 37 wires. For the users’ convenience, the most widely used rope classifications are listed and described in Table 1. When a center wire is replaced by a strand, it is considered as a single wire, and the rope classification remains unchanged. The wire rope cross-sections illustrated in Figure 7 and 8 represent some of the most commonly used configurations, and are arranged under their respective classification groups. Since these are in greater demand, they are more generally available.